NASA-NOAA's Suomi NPP satellite found that as Post-tropical cyclone Olivia was being strongly affected by wind shear in the Central Pacific Ocean. 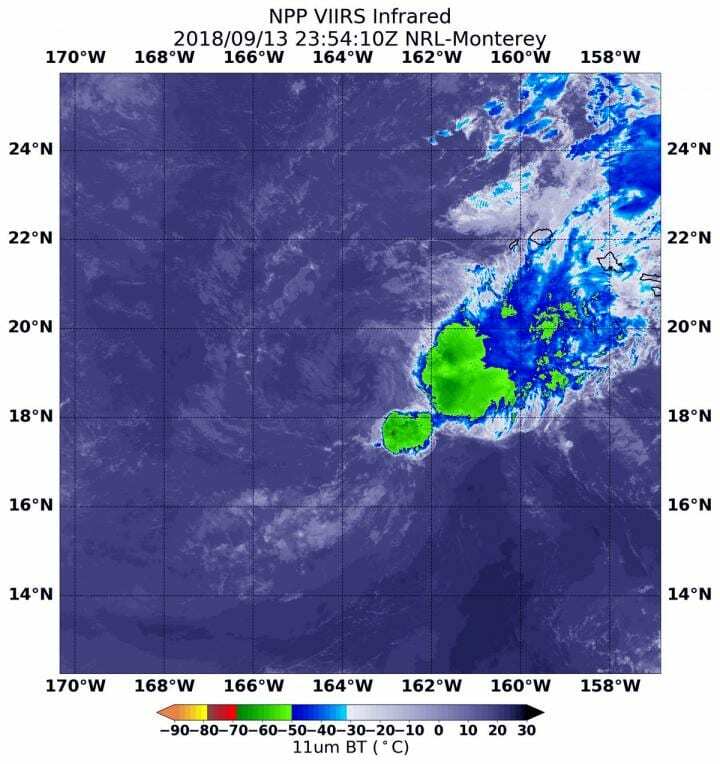 That shear was preventing the development of the thunderstorms that would revive the storm, so it weakened into a post-tropical system and is expected to dissipate over the weekend of Sept. 15. Infrared imagery on Sept. 13 at 7:54 p.m. EDT (2354 UTC) from the Visible Infrared Imaging Radiometer Suite (VIIRS) instrument aboard NASA-NOAA's Suomi NPP satellite showed that Tropical Depression Olivia was being affected by westerly wind shear that was pushing the bulk of its clouds east of center. In general, wind shear is a measure of how the speed and direction of winds change with altitude. Wind shear can tear a tropical cyclone apart or weaken it. At 11 a.m. EDT (5 a.m. HST/1500 UTC) the Central Pacific Hurricane Center issued their final advisory on Olivia. At that time the center of Post-Tropical Cyclone Olivia was located near latitude 18.9 degrees north and longitude 164.2 degrees west. The post-tropical cyclone is moving toward the west near 15 mph (24 km/h). This motion will continue into Friday, followed by a turn toward the west-northwest on Saturday. Maximum sustained winds are near 35 mph (55 kph) with higher gusts. Weakening is forecast, with dissipation expected by Sunday.